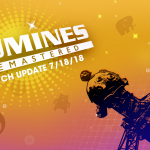 Below are the patch notes for the PlayStation 4 and STEAM versions of Lumines Remastered. A new patch update (version 1.04) is live, as of 07/20/18. A new patch update (version 1.03) is live, as of 07/20/18.